Look—I have 15 cups of coffee a day—I mean, I have 15 decaf grande half-soy, half-low fat, iced vanilla, double-shot, gingerbread cappuccino, extra dry, light ice, with one Sweet-n'-Low and one NutraSweets a day. So? Starbucks joke from George Carlin, bunny courtesy of sender-inner of—oh shoot—where is he in my beeeelions of emails? Shoot. So it's a male bunny? That's quite a head of foam on that hot chocolate! At first I thought those ears were legs. What kind of little animal would that be with its head, arms, and torso in the mug? Teehee, it's a funny bunny. Another bunny creme, as well? 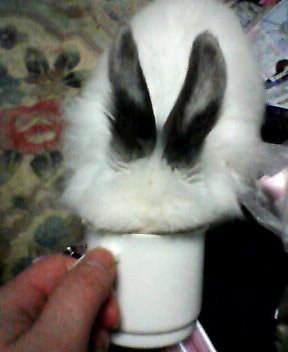 I do wonder what was in the bottom of that cup to get da bunny to stick his face in. Man-that's what I do every morning before I go off to teach my 8 am class-classic! Foam is getting out of control these days! Bun-a-chino? Wit a Timothy Hay Scone, to go. I want to be served by this Bar-ears-ta! I'm just waiting for the peeps to say "caffeine kills bunnehs!" Oh brother, in anticipation. I'll just have to continue to chug." "I do wonder what was in the bottom of that cup to get da bunny to stick his face in." I'm gonna guess it's the last few drops of a Carrot-Cake Cappuchino! Java java java java java java java java java java java java java java java. I'm just waiting for the owner to turn the coffee cup over and read 'Kobayashi Chinaware' on the bottom. wow, magicians must really be working hard to keep up with the times! "And now I'll pull a bunny out of my espresso cup!" "I'm just waiting for the peeps to say "caffeine kills bunnehs!" Dara, it ain't generally the peeps who go all negative, those would be the Nuffinghams. That always makes me sigh. Come with me, you can too. Nice, TJ, very nice. Better earworm than I was walking around with so far today. Also, this bunista is clearly taking "quality control" very seriously. Actually, Dara, we can't even tell what's actually IN the mug (other than the rabbit), so anyone who does complain will be going on insufficient data. That's what you call being ears deep in your java. "Toto-ny" James - Beautiful. True. Happy little bluebirds to you. Sure beats having the *other* end of the rabbit in your cup. Is bunnehs in your cup. Laurie C: Kopi Luwak, bunny-style? Just wanna say thanks to everyone for keeping me amused today. I am all alone today at work. There are fricking tumbleweeds blowing down the hall outside my office. Aubrey, as usual I suspect you have a clue. LOL, Laurie C! I hadn't even thought about having the other end of a rabbit in my cup. And, now in honor of the Irish let's all sing a round of Whiskers in the Jar. Redz, what's the point of giving you all those management training seminars if they leave you alone with no one to inflict your mad new skillz on? Wow, Redz, how weird to be all alone at work! What are you doing there? Go home! No one will know! TJ - and your song's ref-rainblows me away! Redz, don't you get a half day or nuthin'? There is a hare in my coffee!!! "decaf grande half-soy, half-low fat, iced vanilla, double-shot, gingerbread cappuccino, extra dry, light ice, with one Sweet-n'-Low and one NutraSweets"
Ok yeah, the bunny is cute, but the power of the cuteness isn't as strong as my will to fix this order so it's in proper *$ speak. Curse you, Corporate Caffeine, for brainwashing me! p.s. Also curse George Carlin. "You're nobunny until somebunny javas you." A cup, a cup, a cup, a cup, a cup!" Redz - sux to be you, all alone in the office. My boss just came by to kick me out. Which is good because I have to go get ready for the annual Thanksgiving Eve Bar Tour. Hooray for cab rides and cheap hotels! Ladies and gentlemen, I give you...The Chairman of the Board! And find I'm covered in hair! Soaking with drool! Kicked out of bed! To go make break-fast! It's the honk-shus, shu-york, shu-u-u-u-York! Ain't that a bun in a cup? I think Starbucks is too snooty for this. I think you get buns in cups at I-HOP.